Water Purification: Survival Necessity or Unnecessary Survival Concept? Water is an essential fluid for all living organisms. It represents a necessity for the existence of human life because people can survive only three to four days without consuming potable water. That is why every part of our bodies requires water for proper function but is water purification necessary? Water is a substance that can bind with some other substances. That makes it vulnerable to contamination. So, not every water source we find in nature is suitable for drinking. There is a common belief that the water from an untouched nature source high in the mountains is usually a safe choice. In this article you will learn to recognize what contaminated water is, when you need to purify your drinking water and purification methods in order to make your stay in the wilderness safer. What happens when you go backpacking or simply stay in the wilderness for longer periods of time? First thing that should come to your mind is finding some source of water. However, the most important thing is that the water is pure and biologically uncontaminated. If the water we consume has some bacterial pollutants, we probably won’t be able to tell. We must take care of ourselves and our long term health condition. In order to avoid dehydration we might get in trouble and be tempted to drink water that seems so pure, so refreshing, and so clean. We mustn’t forget that the mountain water or spring water may contain some particles which might have negative effects on our body. It would be wise not to take this for granted. Water purification is a crucial procedure even though we are in nature. By educating yourself about the dangers of consuming contaminated water, and methods to purify the water you can escape many health issues and make your wilderness survival enjoyable. Why Should I Use Purification Methods, How Can Contamination Occur in The Wilderness? Nowadays, industrial and technological pollutants are present in every part of the Earth, and they represent two of the most responsible pollutants that unbalance the quality of water. Some micro particles and parasites also can be found in the water. All things considered, water composition can change during different weather seasons or it can simply be changed by time. There is no completely clean water in nature! Water should, by definition, be a fluid with no color, taste or smell. But it is not always like that. Sometimes it contains impurities that shouldn’t be found in the water. Let’s go back to the basics in order to understand the contamination process of the water. Evaporation causes the water to go in the upper layers of the atmosphere and rain back to the rivers, lakes. This is the continuous water cycle. The tricky thing is that it absorbs some of the elements it touches during this process. It is a fact that any water source might have impurities inside, even though it is from a mountain source. You can drink water from 10 different sources and not catch any bacteria or virus, or you can drink from one water source and catch some kind of bacteria. There are no guaranties. This is a chance no backpacker should ever consider to take. In order to make sure that the water is clean, you can use different purification methods. Before being given the chance to purify the water, first of all, you must find it. You can sterilize water which is located on ground surfaces like lakes, springs or water that is collected from rain, snow or ice (when you have no other source of water). There are various opinions among backpackers about which might be best method for water purification in the wilderness. Take a look at our suggestions and choose your most convenient one. There are many materials in nature that can be used for making your own filter for water purifying. People used this type of system long ago; even nowadays, some of these systems are used in tribes in Africa where there is drinkable water deficiency. 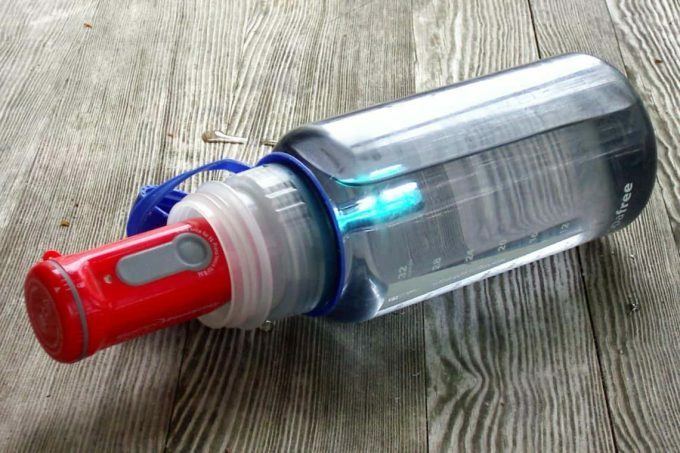 For building this filter you will need a simple plastic bottle which you should cut in the middle and turn backwards so that it looks like a funnel. You then start filling the bottle in layers. First layer, which would be the bottom, should be filled with dry grass (hay). Second layer is sand, after that comes a layer with coal (you can make this on your own by burning tree branches), and at last layer with stones on the top of the bottle. What happens when water passes through all of these layers? First it gets purified from the larger soil type, after that when passing through the coal, it acts like a nature disinfection material; and through the hay we get purified water. The water obtained this way is used for drinking only in extreme situations of water shortage. To destroy all the bacteria in the water this method is combined with water boiling. It is used because it’s an easy and natural method that doesn’t require planning ahead; good for surviving unexpected situations in the wilderness. From a biological point of view, we use water boiling as disinfection of the water from microorganisms. High temperatures above the water boiling point kill most of the bacteria. This is another option of water purification, although not the safest one. With correct implementation of water boiling most of the bacteria can be neutralized but they won’t be eliminated completely. You can use a pot for boiling the water and heat it for five minutes but it is better to boil it for 10 to 15 minutes in order to kill all the microbes. This is a process that would take some time, and you would probably prefer to skip it, but you must remember that one of the side effects of contaminated water is vomiting. That would be a condition that would make your survival in nature a little more challenging and a not so pleasant experience, so you do the math. You can’t use the water immediately, which now before a computer is not a big deal, but it might become more serious if you are seriously dehydrated. During the boiling process part of the water can evaporate before usage, so have that in mind. Even though this method could help you in some serious and dangerous situations you should know that this is not the most convenient, nor the safest method of purification. You can use this method for your camping trip or your mountain journey, however. It is a simple way of clearing the water and it is all natural. You don’t need any special equipment for this method, just a bottle. You may need a lot of time but remember, survival in the wilderness is not a simple task; you must put some effort on it. SODIS means solar water disinfection. More precisely, it is a procedure which uses the energy of the sun for water disinfection. The sun’s UV light kills the microbes in the water. All you have to do is fill the bottle with unpurified water and put it on the ground where the sunlight can reach it. It is however recommended that the bottle is a glass one since a plastic bottle can leach toxins. So if a plastic one is used, you would be cleaning the water from one type of contaminants and filling it with other ones. Leave the bottle for one day and drink your clean and fresh water. The advantages of this method are its simplicity and that it does not require any expensive chemicals. However, it all depends on the weather conditions. The sun must shine for maximum effectiveness, and rainy days are powerful enemies of this purification method and not at all desirable. There are also UV light devices on the market that have the same function but are well designed and more convenient to carry. They significantly shorten the time required for obtaining clean water. They have a UV lamp inside and the best thing is they are battery-free. This is an opposite way of getting fresh water, weather-wise speaking. You don’t have to wait for better days to come in order to drink clean water; we have other good options of obtaining pure water. You have seen millions of pictures of people with their mouths wide open, catching the rain to quench thirst. We don’t recommend that, although a few drops certainly won’t do you harm. The first step is to leave your container out in the rain until it is full. After that, leave it two days outside for the dissipation of minerals to occur. After that you can store the clean water and of course use it when needed. You can combine these two weather dependent methods and be prepared in any weather situation. After all, that is what survival is all about. This is a natural method for purifying water in case of an emergency. This one actually requires a plastic bottle and a dressed person in nature. Take off your shirt and use it to create a water filter. Cover your empty bottle with the shirt. Afterwards just spill from the contaminated water to get rid of the bigger particles and obtain fresh water. We all know that sometimes we aren’t equipped and prepared enough for our wilderness journey and suddenly, in one moment, we are out of water. But don’t worry, it could happen to the best of us. Simply find a river or lake and dig a hole around one meter from it. The hole will eventually fill itself with water and will be naturally filtered because of the sand and soil. This method of water purification is similar to the first one, only in this case, the hole is acting as a natural filter. You must be aware that this process is not highly effective, meaning it doesn’t kill the bacteria and viruses that may exist. This is the lightest and the easiest method of purification. In a matter of minutes you will have clean water that will guarantee you some level of safety. The issue for some nature lovers out there is that these are in fact CHEMICAL tablets. And not many people want to go to nature and bring chemicals in their pocket. However you decide, they are light and don’t take much space, so bringing them with you can do you no harm. Some of the pills contain organic chlorine. These pills are approved and recommended from the WHO and are NATO approved too. You need one pill minimum to put in one liter of water. After using these chemical pills, the obtained water is safe for using. The pills neutralize organisms which cause illnesses like diarrhea, staggers or typhus. It is best to read the manufacturer instructions first in order to know the proper dosage and the side effects. This is a simple straw with a filter inside, relatively new on the market but widely used. It works the same as the first explained method except you have to remember to buy it and take it with you in the wilderness. It is so simple for using that it will make you question its ability to purify, but don’t worry, it is safe. It might not kill all the bacteria and viruses but it will certainly kill the bigger particles and pathogens inside the contaminated water. Before the straw, this was the best option out there, although for some, it still is. There are two types of filters: pump-action and drip-suction. They are both very light and come with a plastic bag in which the water is stored. The only thing you need with this method is preparation. It is very important to take 2% iodine or iodine mixed with other substances. Mixed, it creates a less significant effect on the water, but also has less negative effect on your body. If you take the pure one, you will need 10 to 15 drops of iodine in 1 pound of water. If you think that the water is very contaminated, stick to the upper limit, otherwise, use only 10 or less. If you use iodine mixed with some substance, the dosage will vary depending the substance. If you haven’t had the time to buy some of the water purification devices, you may have some chlorine at home. The amount you put in depends on the water temperature and the impurity of it. You want to put some chlorine in the water and leave it aside for 15 minutes. When you get back it should smell like chlorine, but the smell shouldn’t be too strong. You can always put more, you can’t put less. To cut a long story short, water purification is a necessity. There might be some serious consequences from drinking water from an unanalyzed source. We advise you to plan your activities and needs ahead. Always remember to take the essential gear with you, even when you are planning a one day walk in nature. Now, when you already know the methods of purifying water, consider making at least 2 plans in case you run out of water. Always make a plan B, and you will always have a happy “outdoors” story to tell. Preparation is the key for surviving in nature. Explore the area, the ground, the water sources, water conditions and you will be always equipped with the best survival tool-knowledge for the environment. For more tips on how to purify water, check out our must-read piece to help you. Now that we’ve shown you our favorite methods of purifying water, let us know what your favorite method is. Have you ever had to purify your own water when you were out in the wilderness? How did you do it and how well did it work for you?